The Oakland Raiders struggled last season, but hopes are high for next season with new coach Jon Gruden leading the way. There was a theme to the Raiders draft it seemed, and that was taking athletic but raw players that they hope to be able to mold into capable starting pieces. The Raiders first two days of drafting left some scratching their heads, but if those players can reach their potential, they could be massive picks. Day 3 saw the Raiders get arguably the steal of the draft, drafting DI Maurice Hurst from Michigan in the fifth round. Hurst was No. 3 on our PFF Top 250 players, and our highest non-quarterback. Health concerns saw him drop but if he can play, he might be the best player in this entire class. Below is a look at Hurst and the rest of the Raiders’ draft picks. 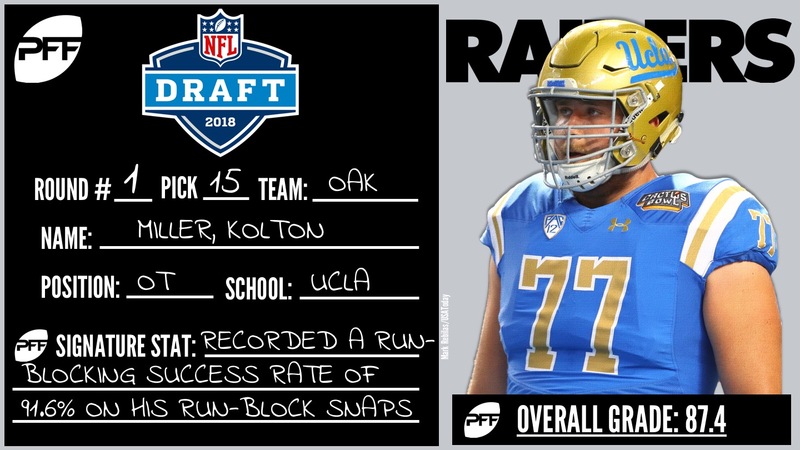 For even more information on who the Raiders drafted and possibly some undrafted free agent players who could make the team, grab a copy of our 2018 NFL Draft Guide with expanded profiles, scouting reports, PFF signature stats and extensive details on over 300 players you cannot find anywhere else. The Raiders traded down from the 10th overall pick and picked up an extra third- and fifth-rounder for it, so that was a great start. They then used the 15th pick to take big Kolton Miller out of UCLA. Miller is the most athletic tackle in the class, but his uneven production over his college career could be cause for concern. While last year’s grade of 87.4 overall was good, he had far too many quick losses in pass protection and run-blocking. Before that he had grades of 79.9 as a freshman and 72.9 as a sophomore. His run-blocking especially needs some work, as he finished with only the 38th-best run-blocking success rate among draft-eligible tackles last season (91.6 percent). With the recent speculation of Donald Penn’s off-field issues, this pick may make more sense. They signed RT Breno Giacomini this offseason, but he’s coming off a really poor season in which he had a league-worst 89.5 pass blocking efficiency rating thanks to a league-high 81 total pressures allowed, and still could be in use of an upgrade at potentially both positions. New offensive line coach Tom Cable likely had a big part in selecting Miller and likely feels that he can mold his athletic traits into a high-quality right tackle to anchor the Raiders offensive line.